Two years ago a friend of mine informed me a congregation of Buddhist monks would be visiting SUNY Plattsburgh where they would be constructing and deconstructing a mandala. Mandala is a Sanskrit word which means “circle.” In the the Hindu and Buddhist religious traditions, their sacred art often takes a mandala form. By the time I received Barry’s message I lacked the time necessary to make the trip from Buffalo. Several weeks after the deconstruction ceremony took place, I received a package from Barry. 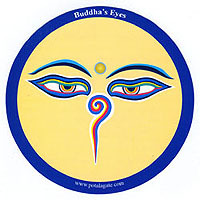 The package contained a brief, handwritten note, a decal depicting the Eyes of the Buddha also known as “wisdom eyes’, a photograph of the mandala and a small packet of sand. This sand was part of the original mandala and had been blessed by the monks prior to the deconstruction ceremony. I am right-brained and very emotional individual. As a result I often experience a great deal of difficulty throwing things away. I am not a pack rat or a hoarder; I just enjoy keeping those things which mean something to me. A couple of months after receiving this envelope I placed it in a drawer in my office, where like many other things I eventually forgot about it. Several times I searched for and could not locate the envelope. Fearing I had inadvertently thrown it away, I gave up hope of ever finding it again. Fall is in mid-stride and with it a low level of depression. Not the kind of depression causing me to not want to leave the comfort of my bed, but the kind causing me to simply not feel myself. I’ve felt tired and unmotivated. My job is going well as is my photography business. My relationships with family members are good. Running continues to improve, sleep comes easily and my meditation practice has remained consistent. Despite these things going well it is the gray skies which during this time of year seem endless and which contribute to this feeling of sadness. Tonight as I cleaned my office after using it as storage, I found I could not locate a battery charger for my point and shoot camera. I’ve become attached to finding the battery charger as the charge is almost completely depleted. My frustration intensified so I returned to bed and began to read. Within minutes thoughts raced through my head. I responded to these thoughts by rising, walking to the basement and searching in the locations where I thought I might have placed this device. I pulled out the drawers of the wall unit where I thought the charger might be held captive. I rummaged through the drawer and found nothing. I stabbed my hand toward the rear of the drawer and my hand grazed a piece of paper. This paper had been pushed toward the rear of the drawer as if it was hiding and did not wish to be found. I pulled it free and looked at the return address. It said, Barry Brown.” A smile tentatively crossed my face and I thought, “Maybe this is the envelope I had been searching for over the past two years.” I walked to my desk and sat down. I gripped the envelope from the side, tilted it downward and gently squeezed it from the sides. As I did, the contents slowly poured from the opening. A folded piece of paper slid easily out as did the other remaining contents which included the Eyes of the Buddha decal and the small packet of colored sand. The small smile which had begun to cross my face had increased in both size and intensity. My depression causing a lack of motivation gently began to lift. A number of positive thoughts came to mind. I thought of my relationship with Barry, the talks we had had and the motivating force he has been in my life. I thought of a dear friend who had passed away last January and the amazing force he had been in my life. I thought of the relationships which I have been lucky enough to call important in my life. I uncapped my favorite fountain pen and penned Barry a letter. I apologized to him for not working harder to meet with him when I returned to the Adirondacks this summer. I never found the battery charger but this serendipitous find gives me hope that if let go of the attachment I had to finding this envelope, I know too I will locate the charger. There are lessons to be learned in such things throughout our life if we simply allow ourselves the opportunity to free ourselves from the attachment of thought and desire.